The purpose of this study was to determine the relationship between academic emotions and self- efficacy in predicting mathematics achievement of secondary school students. 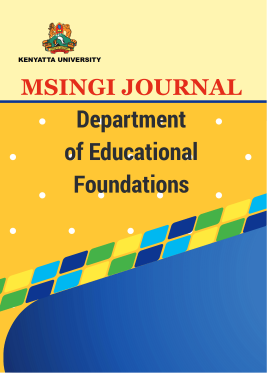 A random sample of 300 form three students (150 males, 150 females) was selected from public secondary schools in Central Division, Machakos County, Kenya. Correlation research design was adopted and data collected using a self report questionnaire. Analysis of examination records was done to obtain data on mathematics achievement. Relationships were determined using Pearson product-moment correlation method while t-test for independent samples was used to determine gender differences between students’ academic emotions, self-efficacy and mathematics achievement. Results revealed a significant relationship between students academic emotions, self-efficacy and mathematics achievement. Significant gender differences were found in students’ academic emotions and self-efficacy. The findings are useful in helping students to develop control over the process of learning mathematics and attach high value to the subject, which lead to development of positive emotions which have a positive correlation to academic achievement.